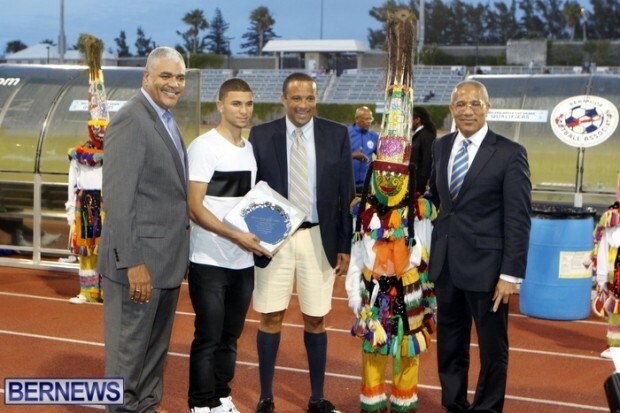 During half time of last night’s [June 4] England C vs Bermuda football game, Nahki Wells was honoured for his accomplishments. The 23-year-old professional footballer was the leading scorer for Bradford City this season, and became the first Bermudian to score at the iconic Wembley Stadium. He walked out, accompanied by the Gombeys, and joined Premier Craig Cannonier, Minister Wayne Scott and BFA President Larry Mussenden on the field. Very nice, and congrats Mr. Wells. Just a question why didnt he play last night not being rude I just wanted to know. I may have missed something. The team could have really used him. He probably didn’t play because he played 54 games for Bradford City this season. It was his first professional season and that a lot of games to be played. He’s a young lad and he deserves a rest! Can’t wait to have him back for next season. Lampard, Rooney, et al played more at a level twice as high yet they put on the England shirt immediately after the close of their GRUELLING season..
Congratulations Nahki – a real Bermuda hero! Totally.It wouldn’t have hurt you to put a pair of shoes and a shirt on. If you want to be a top player behave like one. Also let’s not get carried away, Bradford have just got promoted from the fourth tier of English Football. Seriously do you know how bad Championship football is – 2 levels above Bradford 2012-13? Very bad, that’s what. Thanks for the response all, many thanks was wondering if it was a contract issue also. This Young man is in a class of his own stop putting him behind past players and give him his due ! HE ALONE WILL DO MORE TO PUT BERMUDA ON THE MAP THAN ANY BUDGET ALLOWS TO PROMOTE BERMUDA BOTH POLITICAL PARTIES LOOK STUPID WHEN THEY PUT HIM AFTER PLAYERS THAT ARE GOOD BUT NEVER GOT TO HIS LEVEL ! SHOWS THE IGNORANCE OF OUR LEADERS !!!!! CONGRATS YOUNG MAN I WILL MAKE THE STATEMENT THAT OUR AIRPORT IF NOT BERMUDA INTERNATIONAL BEAR YOUR NAME ! AS YOU MAKE US ALL PROUD AND FANS !!!!! MOVE FORWARD and stop the banana republic act with the gombays that have really no bermudiam heritage other than what is impossed or led to beleive! attractive cheerleaders are more likely to bring a smile to just about anyone versus the annoying dance and noise on the back ground either way ! Mr. Wells you make us all proud and wish you continued success. Did “Bermy Boy” really go on about his attire? But he’s not a hater.. lol Bermudian’s need a serious life. This last minute 3 minute presentation is being critizied. what are you doing with you life? They are JUST honouring him for his accomplishments why does he need to be dressed in white collar attire? I’m pretty sure dudes mad he’s in the stands or in the streets. Nahiki is on a Contract with Bradford City I am sure that one of the reasons he did not play football the other night, one becuase of his contract/& Insurance and 2 Nahiki has a job with Bradford City they cannot afford for him to get injured. Watching the interview with Colin Thompson last night how impressive it was to listen on how well these two young men spoke “hats off to their parents”. These men were praising their parents and family for their support without them they may have not got where they are today. My impression they came from very good homes. Very Proud of you both and wish you further success in your football careers. Average League 2 player. If he was English, no one would even mention him.